The ECBC Trident Messenger Bag is perfect for the road warrior of any age. If you are a frequent traveler, you’re well aware of the hassle of getting through TSA checkpoints, sometimes multiple checkpoints for the same trip when you have connecting flights. My husband’s solution has been to wear a travel vest with a zillion pockets filled with all the little things he would have to take out of his pockets and otherwise place in those filthy gray bins: keys, loose change, his cell phone, earphones, etc. He sends his vest through the conveyer but we still have the hassle of one of us taking the laptop out of our carryon bag and removing it from its protective case. At that moment, with passengers lined behind you as far as the eye can see, you feel like you can never do it fast enough. Given our less than elegant solution to getting through TSA security, we were delighted to have the opportunity to try out the ECBC Trident Messenger Bag, which is touted as TSA-friendly. On a recent trip, it worked like a gem. 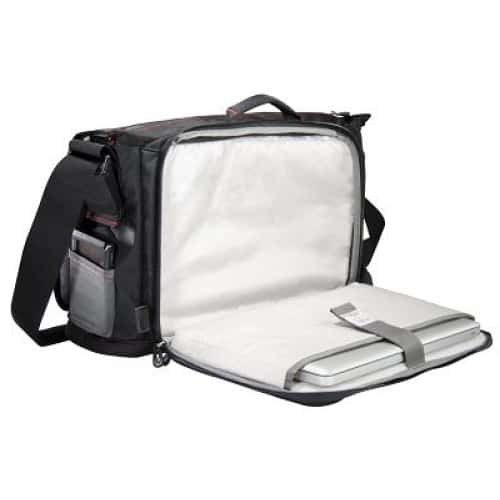 The bag has an abundance of roomy hideaways for every electronic gadget and gizmo we take with us, including a power cord, power strip, and other wires and cords. The zippered and Velcro outside pockets are especially convenient for stashing a cell phone, passport and boarding pass. But the ease of the TSA-friendly FastPass® compartment was the clincher. The lightweight messenger bag, made of high-quality ballistic nylon, has an easy-to-open top zipper. Once your laptop has been stowed in the padded insert, you can unzip the compartment, spread it open for TSA inspection and send it through the conveyer. When it comes through the other side, all you have to do is re-zip. Our adult son belongs to the legion of tech workers who have given up backpacks for messenger bags to carry their laptops and gear. Although The Trident comes with a removable padded shoulder strap, my aging shoulders probably wouldn’t tolerate the weight of messenger bag, even with a lightweight computer inside (I use an 11” MacBook Air). Luckily, the Trident Messenger has a fabric side panel that slides over the retractable luggage handle on our carryon, making stowing it on top virtually effortless. Once we boarded, the messenger bag (19.4” H x 12.6” W x 5” D) could be tucked righted under the seat in front, affording me easy access to my laptop during the flight. The Trident Messenger bag can handle laptops up to 15” in size and retails for $119.99, available online from its manufacturer, ecbc. It’s also discounted at Amazon.com. Disclosure: ECBC provided this Trident Messenger Bag for my review. Any opinions expressed in this post are my own. I am always on the lookout for better carry-on options. This TSA-friendly messenger bag. Thank you for this introduction to this product! Sounds like a great travel product!